Today I had to start living in a new food world – one where my decisions about what to eat are not dictated by how I’m feeling at the moment. It’s no longer a case of do I want to be virtuous and have a Kale salad? 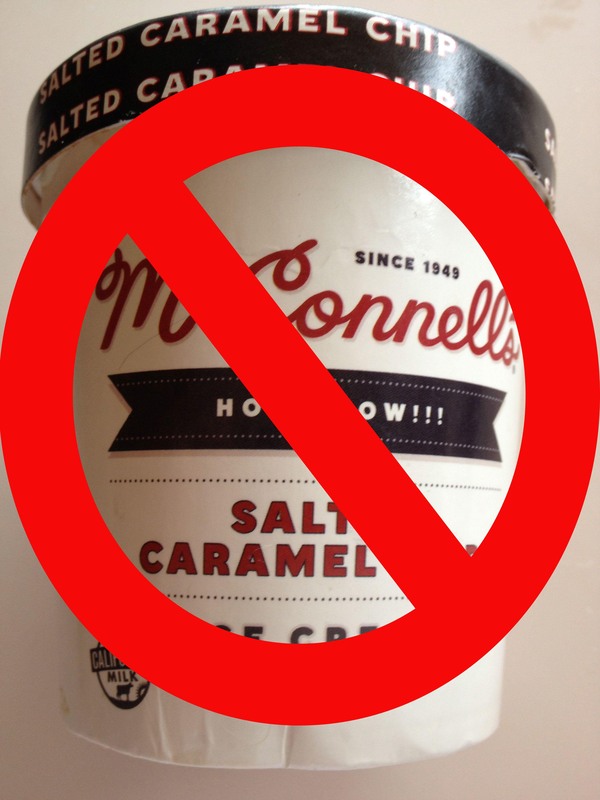 Or do I want to be bad and have a scoop of McConnell’s Salted Caramel Chip? Neither of those options is open to me, because the only choices I can make are from the food that I was grateful to score at the Franklin Center yesterday. (Of which the value I estimated to be $80). So it would have been great to start the day with a bowl of the Corn Flakes I got, but I have no milk. I might enjoy my bagel, but I have no butter. 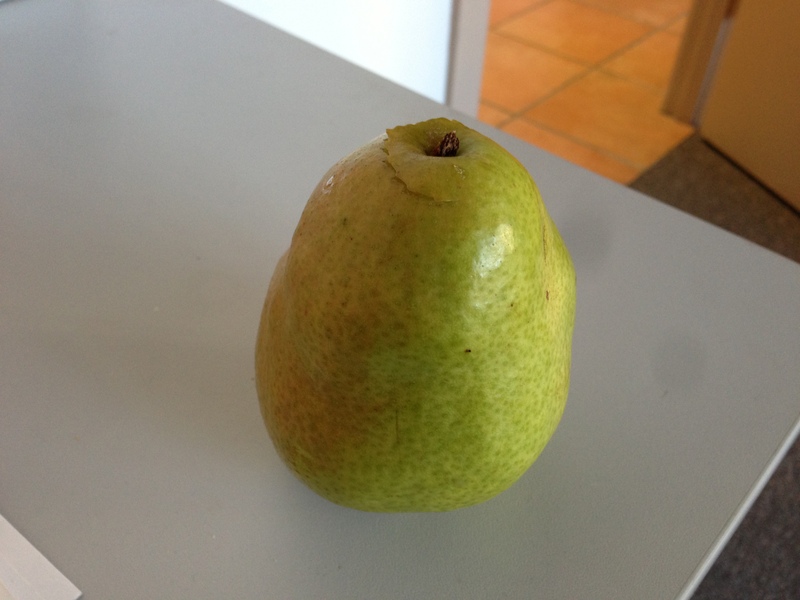 I could have another pear, but that was my focus yesterday. I’m not about to begin the pear diet. I am in a hurry to get to a meeting at work (although in my simulation, I would be going out to look for work) so I leave without eating any breakfast. Once I can get some food stamps I can go and buy some of the things that are stopping me making good use of the food from the distribution. An onion, some oil to cook with. Some way of making culinary sense of the random items I received from the Franklin Center. Trouble is, I’m not going to get any food stamps today. My ‘rush’ application went in, but there is no word today. I will have to devote time tomorrow to going in to the DSS and waiting there, maybe all day, in the hope of getting a cancellation, so I can be interviewed and have my application move forward. (In my simulation, I am not actually applying for food stamps because I haven’t actually lost my job and would be turned down. I am merely going through the stages, waiting what the typical wait would be and then keeping to a budget limit of $200 for the month, which is the equivalent of what I would receive). Today I went window shopping for food. To plan some of the items I will get once my ship (or my stamps) come in. I live near Milpas Street which is a major commercial artery in Santa Barbara. State Street is the main drag with Saks Fifth Avenue and all the nice stores. Well, Milpas Street is the Latino State Street, with lots of local businesses. The only chain stores are fast food restaurants. 1. 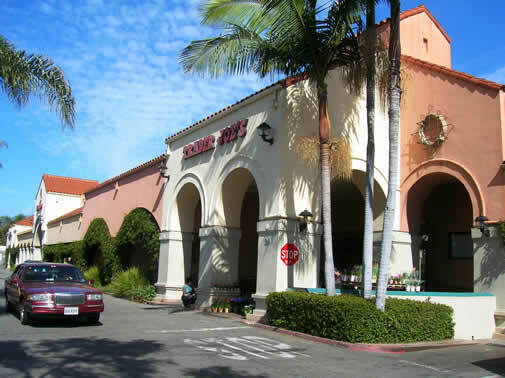 Trader Joes – Where the Californians get their nice little foodie snacks. It does have some basic items very cheap though. It is a question of picking the right things. 2. Fresh and Easy Neighborhood Market – It’s not actually a neighborhood market, it’s a chain of mini-supermarkets that is actually owned by Tesco, a large British grocery company. (Which probably accounts for you being able to buy English chocolate there – good to know, but I doubt I’ll be able to afford that on the Food Stamp Diet. Fresh and Easy is the newest food store on Milpas Street. They have some bargains and they have specials that are about to go out of date at the end of each day, so I might have to start hitting the store at the right time. 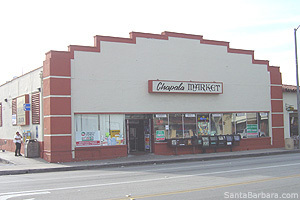 3.Chapala Market – This is a midsize store that caters to virtually a completely Latino clientele. It is a locally owned store and I am glad that doing this challenge has given me the opportunity to start frequenting it. I have already spotted some significant bargains in areas as different as brown rice, rice vinegar and fresh produce. The trick for me will be to get the right balance of items from the three stores…when I get my food stamps. I have started reading what is a pretty appropriate for my situation book called ‘The End of Overeating’ about how the American public has been led to an addiction on sweet, salty and fatty foods by a short-circuiting of the mental processes that normally keep weight steady. And even better I got the book for a dollar from a sale at the local library. Lunch – bacon bagel – bacon is what I got at the distribution. Dinner – Curried Cauliflower with watercress and plums. I had to put that cauliflower out of its misery and I though I would use some of my dried plums. It ended up sounding better than it tasted, because I had no onion to cook with it. No way of balancing the flavors. 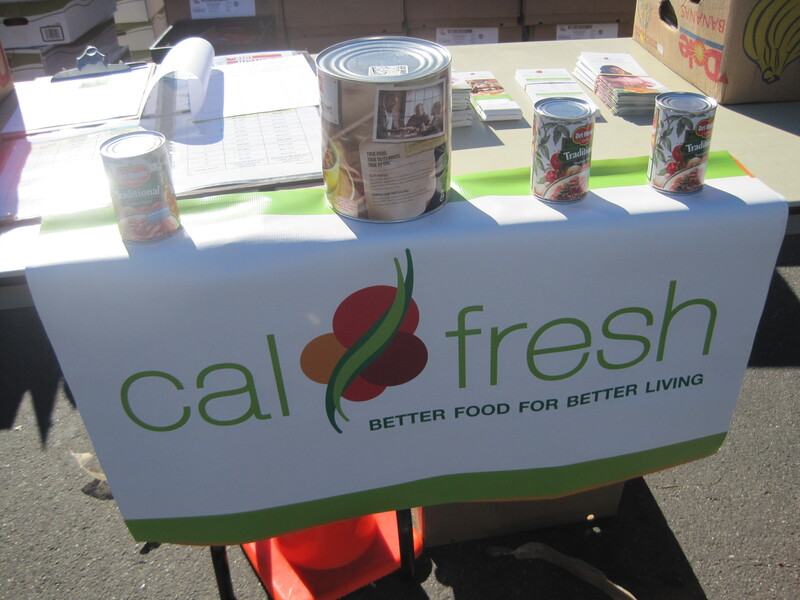 It’s all about can I live healthy on Food Stamps (CalFresh) for a month. But of course the first challenge is actually getting hold of the food stamps, or in today’s world my EBT (Electronic Benefits Transfer) card that would contain them. For the purposes of the challenge, I am imagining that I have lost my job and have no income coming in. A lot of people only turn to food stamps when they have exhausted other possibilities, because they figure ‘they’re not the kind of person who goes on food stamps’. I’m as proud and concerned with my self-image as the next man, but because of my job as CEO of the Foodbank, I also have insight into the huge increase in the numbers of ‘not that kind of person’ people who have been forced by the recession to take advantage of food stamps. They are one of the only federal benefits designed to assist with situational poverty, so they are there to be used. There are also many others who are stuck in low-paying jobs and still qualify for the ‘supplemental’ nutrition that food stamps provide. Over the next 30 days, I am committed to only eating only what I could buy with my monthly allotment of food stamps ($200 for the month) or what I am able to supplement from Foodbank neighborhood distributions – especially fresh produce. I woke up on day one and found out that my luck was in and that the Foodbank would be holding a Mobile Food Pantry at the Franklin Center, my local neighborhood community center. Even better, there would be an outreach worker there from the Foodbank who could help advise me about whether I was eligible for food stamps and who would help get me started to being able to access them. The only catch is that the food distribution starts at 2.00pm and so breakfast or even lunch are looking like luxuries that I cannot afford. Assuming I can get something I can eat there and then, it will still be 17 hours since I last broke bread. I’m used to doing exercise each morning, which I did, but that took a lot of energy, so by the time 2pm rolls around, I am probably even grumpier than usual. In fact I have kind of a headache. I have been drinking a lot of water and that has helped. I show up at the Franklin center and find about a hundred people there already. Some have been there for a couple of hours already. I live on Santa Barbara’s east side, which is a predominantly Latino residential area. Up above us the hills rise to where there are big homes and a very rich area, Montecito, is not far away. Yet in my area there are plenty of families living on very low wages and seniors living on minuscule fixed incomes. They look to their local community center and the services that the Foodbank and our member agencies can provide through it. 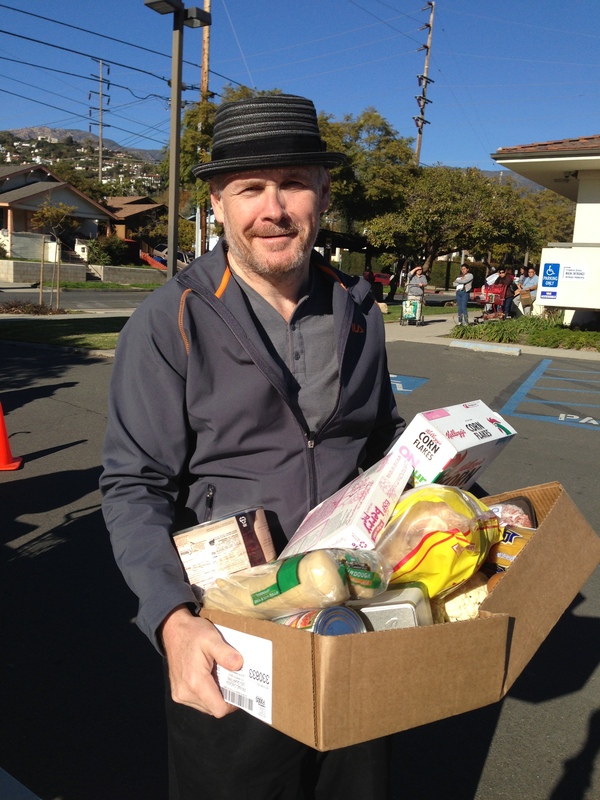 The Foodbank provides some food help to one in four people in Santa Barbara County, which is a startling statistic. That is why our focus has changed to the educational and self-help programs which will enable people to no longer need our help. We want to help people now, but also provide them with the skills to eat healthily with not a lot of money. That is part of the reason I am doing this challenge, to be sure that I am not asking of anyone else something which I could not do. I am lucky to have advantages of education and good health, but we want to help people draw on their natural strengths and to use good nutrition as a basis for leading healthy lives. 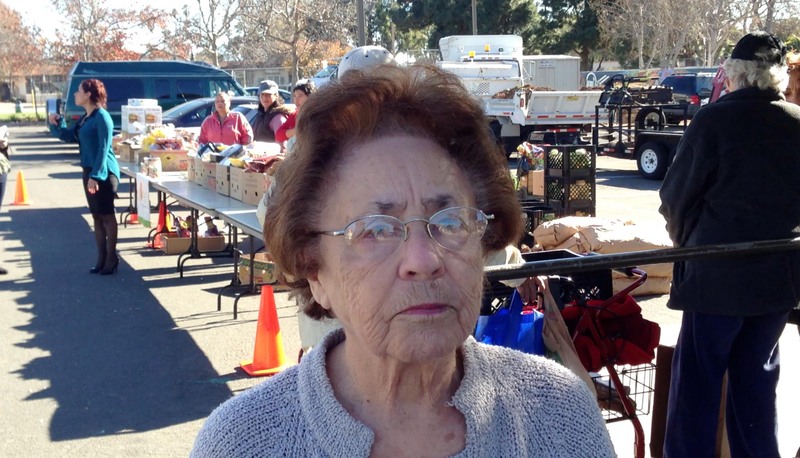 While in the line, I chat to Doris, a lady who has lived in SB for 66 years. Her and her husband find it hard to make ends meet and the food they receive from this distribution makes all the difference to their health, especially with vegetables being so expensive. At the front of the line, I get a box to put in my allocation of food. This distribution is only once a month, so the amount of food each person gets is pretty large – you have to remember that this is got to last as a 30 day supplement. 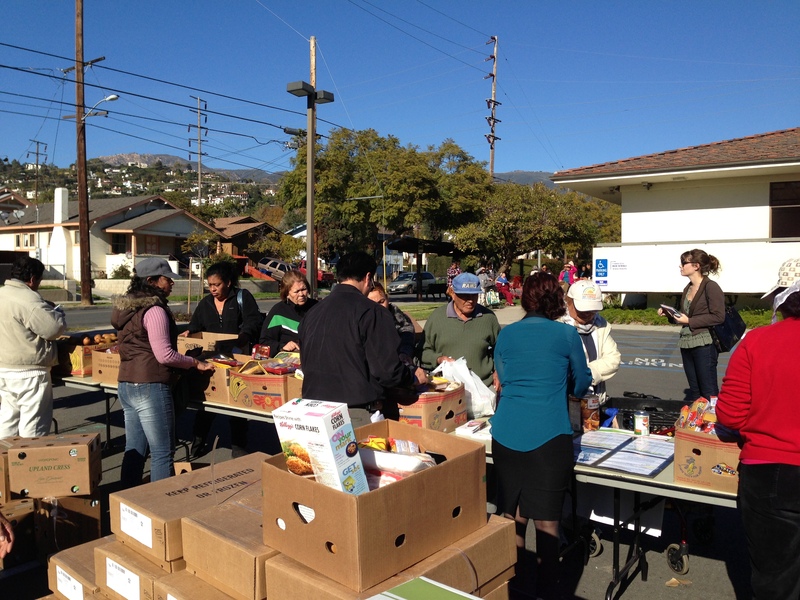 At this particular site, it is backed up by Mobile Farmer’s Markets providing fresh produce distribution each week. This is a bunch of food. I’m lucky that I have a car to bring it home. If I was a senior citizen on foot, I couldn’t drag that lot home, especially before the frozen stuff started to defrost. At this point I should spell out to people that I did not take this acutal it would be achieving the opposite of my job for me to be an actual drain on the resources that we have available to help the public. Consequently, I am purchasing the food rather than using actual food stamps, and when I get food from a distribution, I give that food back, so that someone else can benefit from it and I buy the exact same items in a store. 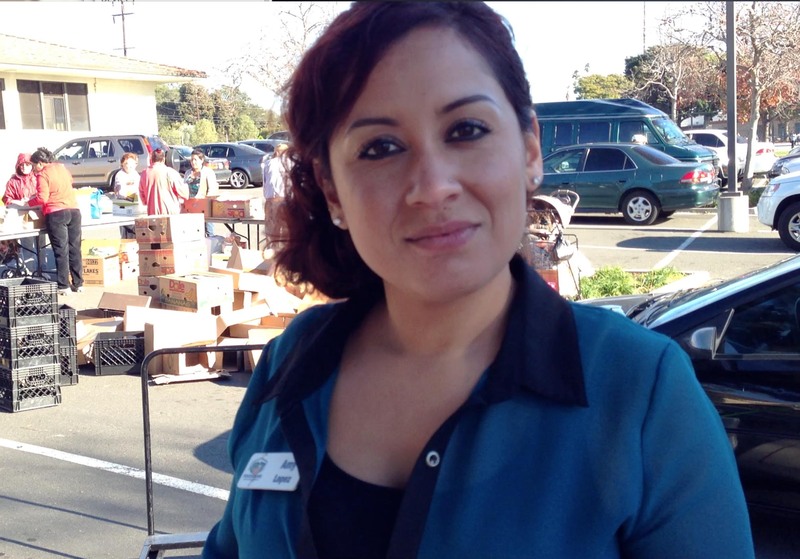 After I grab one of my pears to get some food inside of me, I get the chance to meet Amy Lopez, the Foodbank Outreach worker. It is Amy’s job to build relationships and trust with the community and to assist them in accessing our services. It is also her job to help people sign on for Food Stamps. 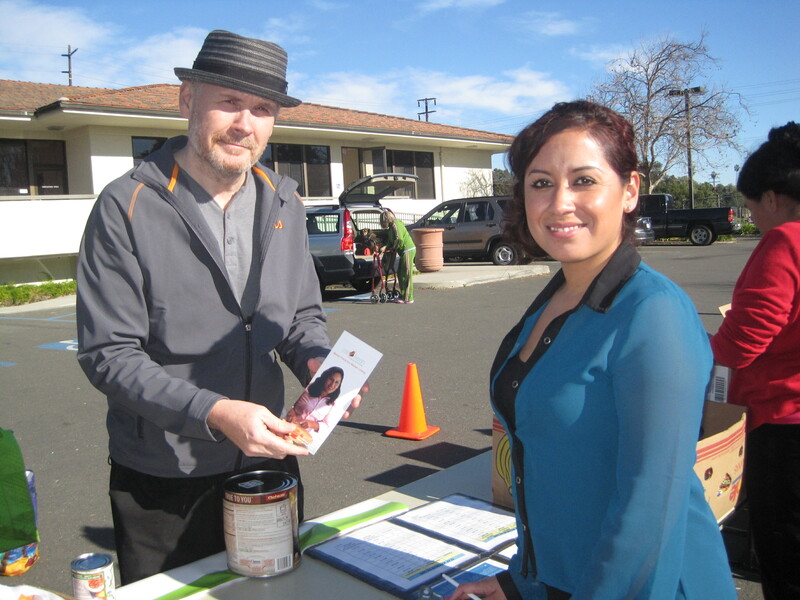 Increasingly, Foodbanks across the national Feeding America network of Foodbanks have become involved in helping promote uptake of foodstamps as this is a great way of getting people the food they need. 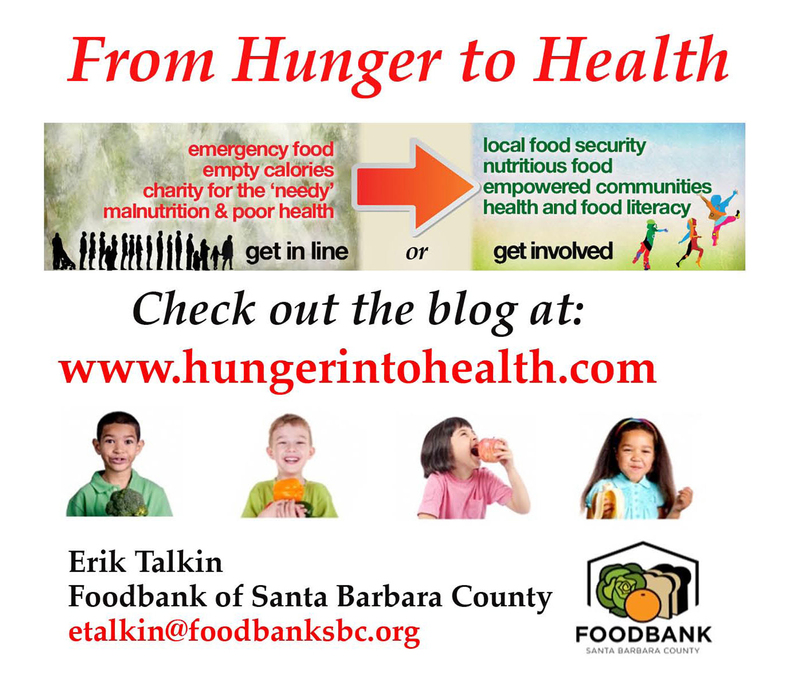 In Santa Barbara county, the uptake level is low – not because people are well off, after all, there are only 14 out of 55 California Counties that have more food insecurity than we do. The main reason is that signing up is very complex, there are lots of myths around who is eligible and what will happen to them. It is Amy’s job to cut through these myths. Food stamps are available to those with legal residency, which might only be the children in a particular family set-up. Amy helps me go through the forms and promises to submit my application electronically to the local DSS. SHe is putting a ‘rush’ on it because I have no income and no savings. But even with a rush, it might be a day or two before I can be interviewed to process my application. I go home with my food and realize that with no milk or butter or cooking fats or other basic items, then my choices are limited with the food I have and which I am going to be very careful at using. I better hurry up with the cauliflower though, because it’s looking a little senior itself.